Poor Market Conditions? Who Cares? With challenges facing the industry, it might not seem like the best time to go public. 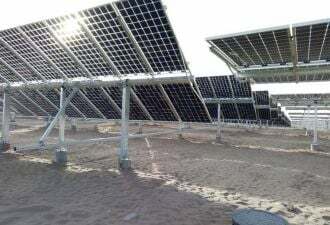 But companies such as ReneSola, Solargiga Energy, Nitol Solar and Qiangsheng Photovoltaic Technology are pushing ahead. With fears of an economic recession, high prices for solar-grade silicon and the possibility that U.S. tax incentives might not get renewed, it's a tough time to be a solar-power company – and, you might think, a daunting time to go public. Solar panel-maker SunPower Corp. (NSDQ: SPWR) shares fell 6.8 percent Thursday, closing at $69.21 per share, in spite of fourth-quarter profits that beat expectations. The stock rebounded Friday, growing 5.9 percent, but investors had been discouraged by the guidance for the full year, which SunPower raised twice, but which still fell short of analyst estimates. Solar shares have been volatile, and have mainly sunk in the last few weeks – although some stocks rebounded a bit Friday. Thin-film darling First Solar (NSDQ: FSLR) shares fell 49.4 percent from a high of $283 per share on Dec. 27 to a low of $143.31 per share on Jan. 23, then grew to close at $171.28 per share Friday -- 39.5 percent off its December peak. And solar-installer Akeena Solar (NSDQ: AKNS) shares fell 64.3 percent from a peak of $16.80 per share Jan. 7 to a low of $6 per share Jan. 22, before climbing back to close at $8.34 per share Friday -- 50.4 percent off its January peak. But unlike in the biofuel industry, where biodiesel company Imperium Renewables pulled back from its IPO plans this month, unfavorable market conditions don't seem to be keeping solar companies from their debuts. ReneSola, a Shanghai-based solar-wafer manufacturer, is planning its New York Stock Exchange debut. It already trades on the London Stock Exchange's Alternative Investment Market. Hong Kong-based Qiangsheng Photovoltaic Technology, a thin-film producer, is planning a $250 million IPO on the Nasdaq, according to Reuters. Silicon developer Nitol Solar, based in Usolie, Russia, in Siberia, is eyeing a listing on the London Stock Exchange that could raise between $250 million and $300 million, according to the Financial Times. And Jinzhou, China-based Solargiga Energy is charging ahead with its IPO even though it had to cut the price target for its Hong Kong offering to about $264 million last week, from a previous range of up to $292 million, citing poor market conditions, according to Reuters. To be fair, Chinese biodiesel company Gushan Environmental Energy also went public on the New York Stock Exchange in December, in an environment that Imperium shunned. That same month, DTN analyst Rick Kment said it would be an unlikely time for an IPO and predicted that Imperium's offering would be delayed (see Imperium CEO Leaves Amid Biofuel Profit Pressures). Solar insiders indicated they aren't surprised that public offerings are still going forward. "They always need money," said Paula Mints, an analyst at Navigant Consulting. "[It] costs a lot to develop the technology, but also, they want it." Mark Cox, CEO of New Energy Fund, a renewable-energy hedge fund, said there's still money to be made. He said he made money trading SunPower and First Solar. "Amidst the bubble thinking in the West, few appear to pick up on the enormity of the solar opportunity," he said. "The German feed-in tariff has been copied by 50 other jurisdictions and China has pledged [billions] to renewable energy, which just blows away Western budgets for [the] same."